Golf Pad is fast, accurate and 100% FREE golf GPS rangefinder and scorecard. It's available for free for Android and iOS (including iPhone, iPod Touch and iPad). Missing a course? Map it in your browser. 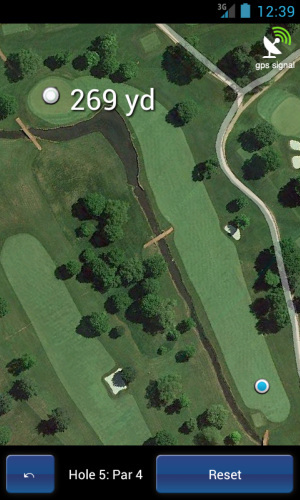 Distance to front, middle and back of the green (meters or yards). Exceptionally easy and intuitive. Stay focused on the game. 100% free. No course download fees. No subscription fees. Search courses by distance, or pick from the recent rounds. 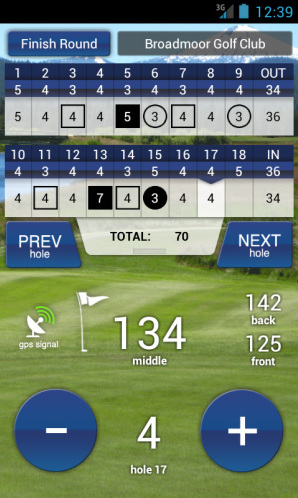 Professional-quality scorecard, same look and feel as PGA Tour on TV. Use 'uncharted mode' to keep track your score on any 18 hole course, including mini golf and disc golf. Large high contract controls are easy to use outdoors. Jump to any hole at any time - just tap it in the score card. Front, back and total scores are tallied up and updated instantly. Golf Pad keeps GPS connection during the round. This ensures the distance is always ready. It also extends battery life, since phone only needs to do initial satellite search once. GPS is turned off automatically after the end of the round. Thousands of users chose GolfPad range finder over SkyDroid, GolfShot, SonoCaddie, GolfCard, SkyCaddie, Easy Scorecard, iGolf and other golf applications. Note, iPhone version is limited to score keeping at this time, we'll be adding more features to match Android version in the future. We'd love to hear from you! Please use feedback form.